Hours: Mon.-Fri. 10 a.m.-9 p.m.; Sat. 11 a.m.-5 p.m. The Earl of Sandwich may have made his famous invention across the pond, but it's Americans who have taken the sandwich and run with it. Literally, at times, because isn't that one of the beauties of the sandwich? When you've packed your entire meal between two slices of bread, you can take it with you. Here in the land of the free and the home of the multi-tasker, we've made a veritable culture of that. But sometimes, even the worker bees buzzing most busily around their Blackberries want to enjoy a sandwich sitting down -- to eat with more leisure, with hands free for a fountain drink, or, hey, maybe even a beer, and gesturing in conversation with one's companions. For those times, the Papazekis family -- veteran sandwich-makers from New Castle -- has opened Hot Franks in the Strip. It's got a sandwich counter and diner-style open grill up front, and a well-stocked bar and beer cooler in back. The space, formerly home to more upscale eats such as the erstwhile Vermont Flatbread, is big, with good bones, but could probably use a more subtle paint job. The reigning scheme of silver and red could be peppy for a little sandwich shop, but it's a bit ... intense in a space this big and otherwise bare. But when you first walk in, the big menu board is the immediate eye-catcher. It lists more than a dozen subs and nearly a score of hot sandwiches, in addition to sides (fries and chili are specialties) and some salads. As you might expect from a family named Papazekis, there are gyros and lamb dishes, but most options are all-American: hamburger, frankfurter, pepperoni (which seems to be more American than Italian) and so forth. 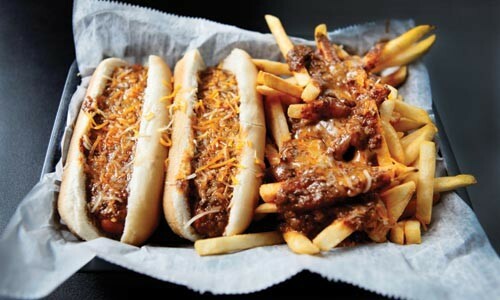 Despite the name, hot dogs aren't a particular focus at Hot Franks, but chili dogs and chili fries are a venerable part of the family's New Castle history, and so Jason tried one, adding coleslaw on top for good measure. The dog itself was ordinary, the chili was dominated by beef rather than spice, and the creamy slaw was manageable rather than messy. All in all, not bad for pocket change -- just $1.65. At a little over five bucks, the Super Sub was quite special. A verbal recitation of the complete meat content was almost more than our brains could process, but we know it included at least two forms of ham, an array of Italian meats and some pretty darn good roast turkey. Most impressively, the meat wasn't slapped on, pre-sliced, from a plastic bin; the counterman fired up the meat slicer to cut the meat fresh. (Admittedly, this added a little time to the sandwich preparation process; those in a grab-n-go hurry might prefer to call ahead.) Of course, Jason accepted the offer of having his sandwich hot, which in this case meant that the meat stack was placed on the griddle long enough to crisp the edges and get the grease flowing. Big, soft, but not insubstantial, Cellone's rolls contained their contents pretty well. (Next time Jason will ask them to grill the bread, too.) But for the thick-cut onion, which was disproportionate to the rest of the filling, the Super Sub was a carnivorific success. Angelique went for the hot sausage, which served up satisfying heat in both senses. She especially appreciated Hot Franks' innovation of using a rectangular, fairly flat sausage patty, instead of a link, for the filling; putting a round link between two flat slices of bun always seems to result in some bites that are virtually all bun, while others contain most of the sausage. The patty worked successfully to distribute the sausage across the width of the bun, while grilled peppers and onions added brightness, sweetness and savor. A dining companion's Philly cheesesteak featured real cheese (not Cheez Whiz, purists take note), but not quite enough of it. The accompanying fries, however, were excellent: fresh-cut, golden-brown, crispy outside and creamy within. For bread-enclosed meals to go or to eat in, Hot Franks offers more than your typical deli or pizza-hoagie joint. The advantage to eating in is that nothing washes down a sandwich quite like a beer. Hot Franks knows that -- and quite a lot more about the Earl of Sandwich's invention.